Yearbook orders must be in by this Friday!!! There will be NO lobby sales this year. 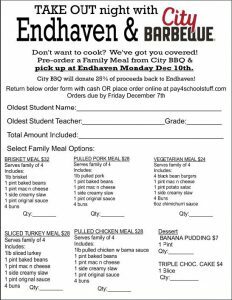 Please pay online at Pay4SchoolStuff.com or send cash to school with the attached form. 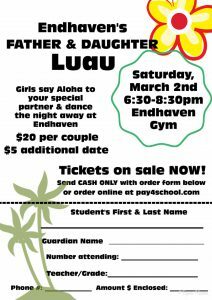 Father Daughter Luau this Saturday, March 2! Get your tickets! Pay4SchoolStuff.com or send cash to school with the linked form. Next week is Red Ribbon Spirit week! Oct 22-26th. 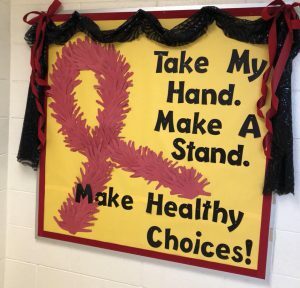 Endhaven’s declaration to make healthy choices. Monday wear red to kick off Red Ribbon week. Tuesday is pajama day. Healthy choices are the key to achieving our dreams! Wednesday wear your favorite team jersey day. Team up against unhealthy choices. Thursday wear crazy socks and let’s sock it to unhealthy choices. Friday wear your Endhaven or blue shirt to show your support for our school making healthy choices!